Nothing will stop us. period. 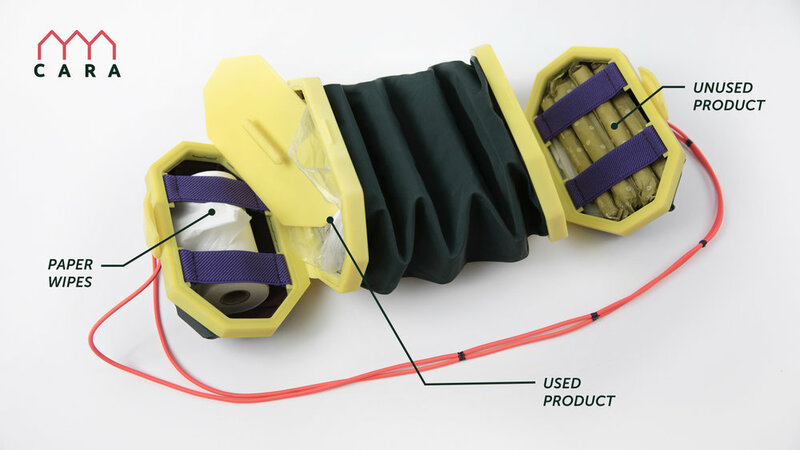 Cara—from the word carapace, as the shell of a turtle—is a menstrual product and waste carrier designed for use in multi-day trips outdoors. It features an expandable waste collection container at the center, and two separate dry enclosures at the top and bottom to keep unused menstrual products, toilet paper, and/or wipes clean and ready to use. 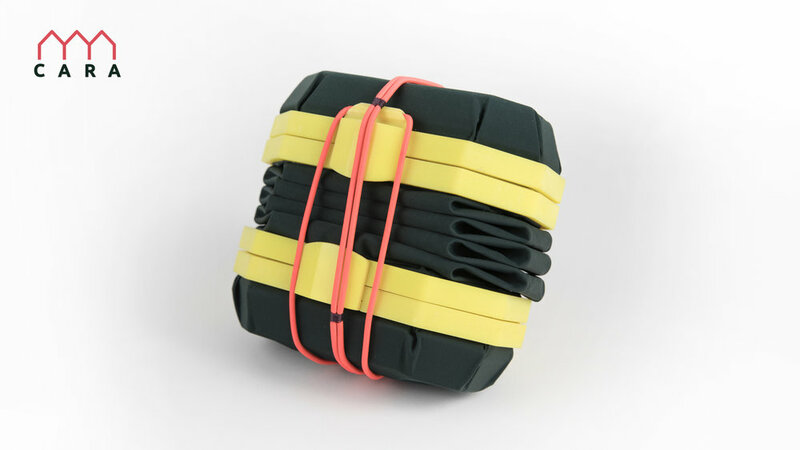 Featured in Conspicuous Design: 5 Remarkable Projects from SVA's MFA in Products of Design and winner of an IDA Design Award for the Outdoor and Exercise Equipment (trekking and camping) category. From the onset of Alexia's master's thesis it became clear that women are incredibly dissatisfied with the design of outdoor gear. Alexia decided to tackle the "shrink it and pink it" design attitude towards women's products, and truly expand the typology of tools for women beyond the superficial to fulfill functional needs. 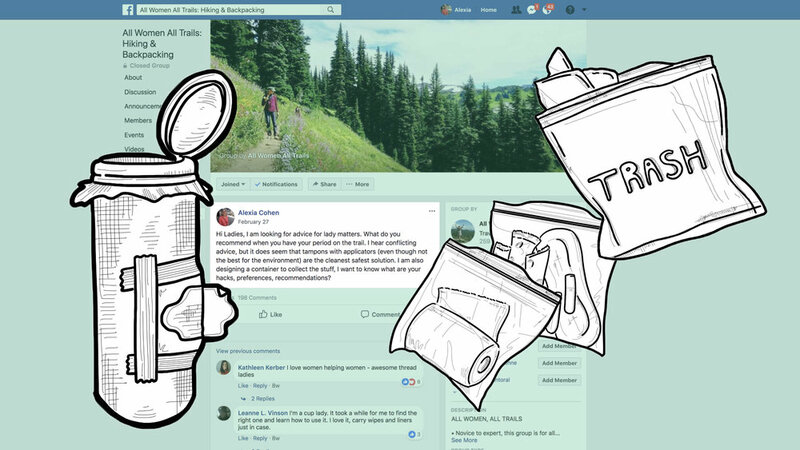 Since menstruation is something a large number of women deal with, Alexia decided to turn to a Facebook group called “All Women All Trails,” a vibrant community of more than 25,000 women who turn to each other for gear reviews, to share tips and tricks, and to look for hiking partners. She asked the community what they did when they had their periods while outdoors. In a matter of 48 hours Alexia had received almost 200 answers to her question. While some of the women were big advocates of the menstrual cup, a lot of them were still using tampons and pads. To collect the used products, they hacked empty wipe containers or ziplock bags covered with duct tape to conceal the contents. Researching further, Alexia discovered that there is nothing on the market designed specifically for this purpose, and with women engaging in outdoor adventure in greater numbers, this became her opportunity. To truly understand the challenge, Alexia carried and collected all of her period products and waste for one cycle using a box created by gluing two plastic containers together. During this experiment, Alexia learned that her solution needed to be a bit bigger, as well as soft and collapsible. To build an articulated structure, she experimented with soft technical fabrics embedded with rigid patterns cut using a laser cutter. After much iteration and material testing, the main frame structure of the piece was 3D modeled to fit the soft patterned fabric and Cara was born. Practically with Cara everything is now encapsulated into one object - unused menstrual products, the used products, as well as toilet paper and wipes - which saves having to dig through a backpack for all these different items. Most critically, Cara celebrates women’s place in the great outdoors by conspicuously recognizing that yes! we menstruate, it is part of being a woman, and we will not let it stop us from doing what we love. Cara effectively works at the intersection of designing for women in the outdoors and designing for women’s needs that are typically deprioritized.